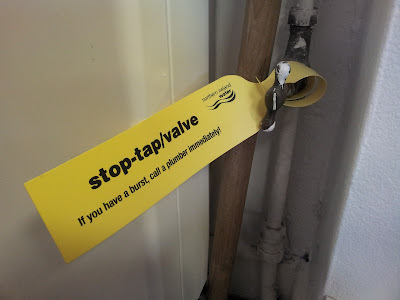 NI Water's free stop valve tag. In the event of a leak, flood or freeze, your first thought should be to stop the threat of a new leak, or the spread of an existing one by turning off your Stopcock, but you need to know where it is! Find your internal Stopcock. It is usually, but not always, located under your kitchen sink and normally closes by turning clockwise. You may want to test it is working. NI Water has produced a bright tag for customers to loop around the Stopcock in their premises. This will ensure they are aware of the location of their Stopcock and it will be easily identifiable in the event of a burst pipe. Tags are available free to customers by phoning NI Water on 08457 440088. Stopcocks are usually found in your kitchen, below the sink unit. However in some houses the Stopcock is found in a front or back hall or in a larder unit beside the sink unit. If you cannot find or do not have a Stopcock it's best to have a registered plumber take a look at your property.